We love living a few minutes away from the beach. Even though it’s not warm enough to put on our swimming suits, we still have so much fun walking along the boardwalk. Barcelona is such a vibrant, bustling city! We can’t go more than a few blocks without bumping into musicians or artists who are well worth stopping for. Skyler loves it and always asks to go see the music. She especially loves the giant bubbles and “dancing boy”, a puppet on strings that dances to hip-hop music. We are really hoping that by the end of our time here, it will be warm enough to dip our toes in the water! I have been dreaming of going to paris since….forever! Honestly, I can’t remember when my love affair with France began. My family is French, so I guess I was born with it. But really, I could not have been happier about our 4 day pit-stop to Paris on our way to Barcelona. As soon as we landed I could feel it, there was something in the air there that just felt so…je ne sais quoi! As we were driving to our Air BnB, I could not keep my mouth shut. I know the taxi driver probably thought I was such an annoying American tourist gawking at all of the architecture and asking “quest que cest?” at everything we passed. I still can’t get over how pretty everything is there. When we got to our Air BnB, we crashed. A lengthy 3 hour nap for me and Austin while Skyler indulged on more Mickey Mouse, which was a definite no for the rules of beating jet-lag…whoops! We quickly realized that this little apartment would not work for us. It was tiny, like…tiny, and the heater did not work. We made the move to a nice hotel that was next to the yummiest cafes. We were much happier and warmer here. Since it was New Year’s Eve, we decided to ring in the new year at the Eiffel Tower. Let me tell you, stealing a kiss from Austin at midnight in Paris under that twinkling tower- may be one of the top 5 romantic things I’ve ever done! I highly suggest you add that to your bucket list. That next day we didn’t wake up until 2:30pm! We were so mixed up on time. We hurried and got ready so we wouldn’t miss any more of our time in Paris. We went to the Louvre, only to find it was closed for New Year’s. So we bought a lock and headed to the love lock bridge. We locked it on to the bridge, kissed the key and threw it in to the Seine River- locking our love for eternity. Then we got tickets for a hop-on, hop-off bus and went around the city. Skyler wanted to sit by herself on the bus and waved to everyone while saying “bonjour!”, it was pretty cute! We saw so many amazing sites, one of our favorites was Notre Dame. I also found out that there is a grave of an unknown soldier under the Arc De Triomphe with an eternal flame. I didn’t know that before. Day three was spent at the Louvre. The line at the main entrance was SO long. Luckily, we read a tip that said there are actually 4 entrances, but most tourists don’t know that. We stumbled across one of the other entrances and walked right in! Honestly, I wish I could say we had an amazing time there, but it was just too crowded and too long for Skyler to sit patiently for. We had to find our way through the maze of crop-dusting tourists to find elevators for the stroller and shove our way through to see the paintings. I hope I can go back again some day when it is way less crowded and really enjoy the museum. Seeing the Mona Lisa was fun, though. My favorite was Da Vinci’s Virgin of the Rocks. On our last day, we went to Versailles. We were all really excited to see this. We knew it would be expensive to get a taxi there, but decided it would be worth it. When we got there, it started pouring rain and was so windy. We were freezing and greeted with an even longer line than the one at the Louvre the day before. We decided to try and buy a private guided tour to skip the line. We found out that there were no tours that day – we had no choice but to wait in the line out in the cold. As sad as we were to not get to go in, we thought it would be best to get Skyler out of the weather and just go back. On our way to get a taxi, we saw a guard standing at a side door. We asked him if there was any way he would let us in that door. He stood there a while, thinking, and we knew it wasn’t likely, but then he smiled and let us in. Not only did we skip that huge line, but he also let us in for free! Fun side story: a nice man offered to take a picture for us, and when he spoke to us in English, we asked where he was from. He was from Utah, too! He and his group of friends were in Europe on a ski trip. They were heading to Barcelona after Paris, like us and we even saw them at church the next week in Barcelona! The castle was amazing and so much bigger than I knew. Since it was such bad weather, we only saw the gardens from the windows- but that’s just a reason to go back some day. We saw so many things and ate so much yummy food – I made it a point to eat as many croissants as I could while I was there. I absolutely love Paris and am so glad we are flying back home through there so we get to go back! Austin and I pretty much had Skyler’s name picked out as soon as we knew she was a girl. There were one or two names that kept getting tossed in the mix, but we always came back to Skyler. We loved it. It was cute and spunky, just how we imagined she would be. It was a really easy decision. The hard name to pick was her middle name. We wanted her to be named after someone. Someone exceptional– but we have SO MANY exceptional people in our lives, it was hard to pick just one. Of course we thought of her grandmas names’ and even went way back in our genealogy looking for names we thought were cute and they were all really great options. I remember the moment we decided on Madison like it was yesterday. We were sitting in a restaurant in St. George when Austin mentioned it. As soon as he said it- it stuck. Not only did it sound beautiful together, but naming her after my first niece was too perfect. I only wish I had thought of it! Flash back 16 years ago when I met Madi for the first time. She was the very first niece or nephew to be born in the family. I fell so in love with being her Aunt. I took her with me everywhere, set up mini photoshoots and would always pretend she was mine. 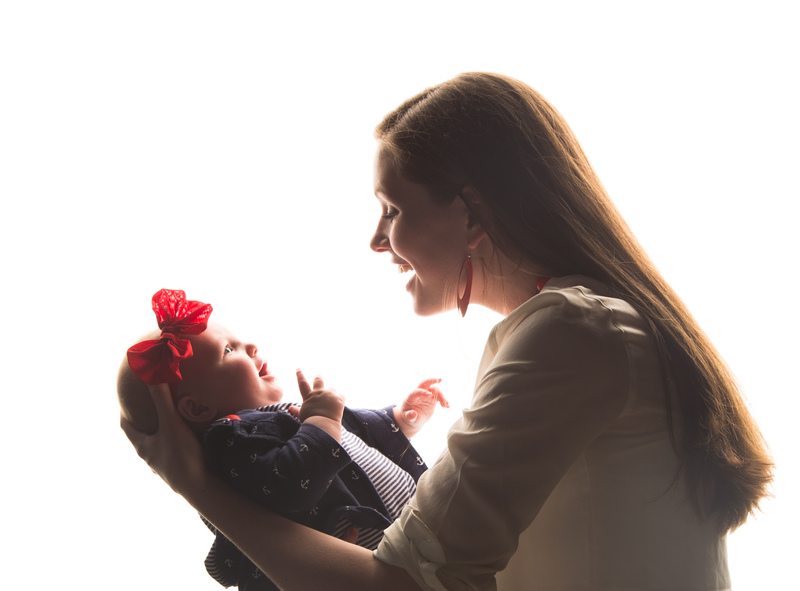 Being the youngest in the family, I never had a little sister to get to play with and Madi quickly became my very own real life baby doll. It seemed so fitting to name my real very first baby after her. I also wanted Skyler to be named after someone she could look up to and to have a special bond with. I am the luckiest to have had four older sisters that helped raise me. I could always turn to them, and often still do, when times got hard and I needed a friend. I know that Skyler and Madison will have that same special bond and that Madi will be like an older sister to Sky. Watching them together only confirms that we named her after the right person. I love watching their little relationship grow and how special they are to each other. I always wanted a little girl, so when we found out at the 16 week ultrasound (that I paid extra for because I was just way too impatient to wait any longer than necessary) that my little bambino was a girl, I was thrilled! I thought all about the nursery decorations, the dresses I would buy her, the bows, oh the bows! 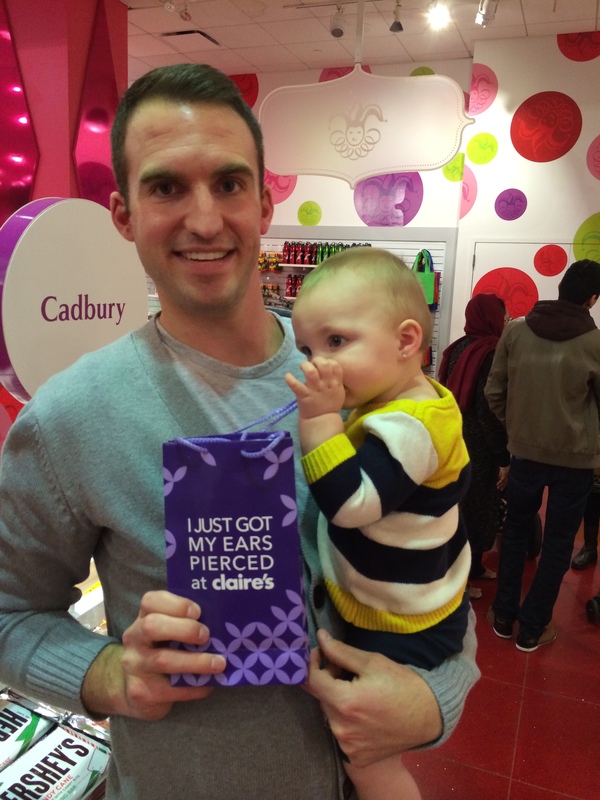 What I didn’t really think too much about was getting her ears pierced, that came later. After she was born, everyone called her the “cutest little boy”. It didn’t help that we named her a boy name, but come on guys, she is covered in pink from head to toe and has a bow that’s as big as her head on. It’s like they didn’t even see any of that. 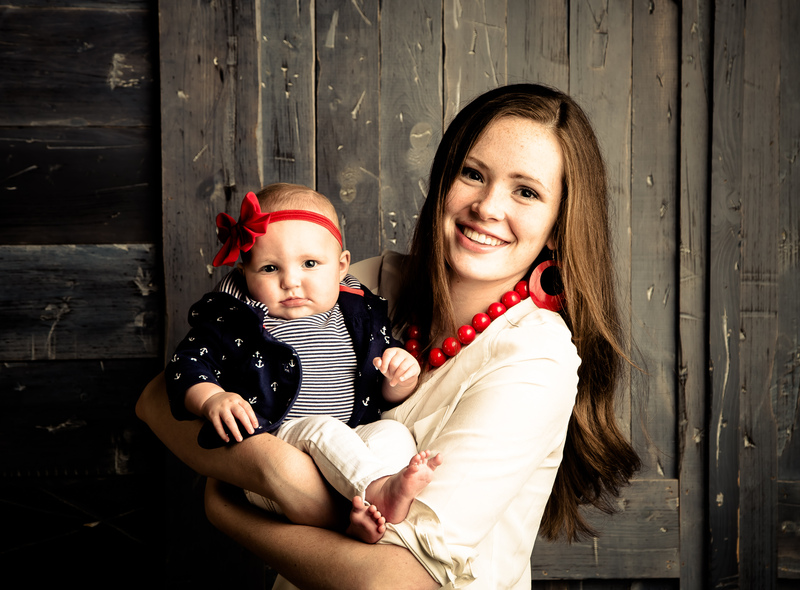 Even at her blessing in our church, our bishop stood up and announced the blessing our our “baby boy, Skyler Madsen”…Well, it’s Skyler Madison and she’s really happy to be here, thanks. I noticed around three months, a lot of her little friends had gotten their ears pierced. My mom didn’t allow us to get our first earrings until we were 12, so I guess I didn’t really think about getting my baby’s done. I asked around on mom groups and from friends and family and got tons of different opinions. It really didn’t do anything but confuse me more. Some people will throw articles at you about how they can get infected or the actual earring gets stuck in the ear- it was a little freaky. I debated back and forth for months and my husband didn’t have an opinion either way. Most the time, I love that he lets me decide these girly details, but this time, I wanted someone to make a decision for me! I really did want to get them done while she was young because growing up without being able to have earrings when all of my friends did was so hard for me. When I finally was able to get my ears pierced, I was terrified and it was a really traumatic experience. If we got them done while she was this young, she wouldn’t have to remember it, I could take care of the earrings for her and she wouldn’t even notice them. One weekend as we were doing a little shopping on Fifth Avenue in the city, we stopped in FAO Schwartz to let Skyler pick out a new rubber duck (It’s her favorite toy and thank goodness, the least inexpensive thing in the store) Well it so happens that they have a Claire’s on the top level. As we were riding the elevator to up, there was a lady who pointed to Skyler and asked, “how old is he?”. As soon as the elevator opened, I marched right to the ear piercing station and decided it’s happening tonight. I was expecting that someone would say no, don’t do it, think about it and we can come back tomorrow. But Austin picked out the cutest little diamond studs and said, “Ok, we’re doing it” and paid for it right then. I instantly felt sick to my stomach and just wanted to go straight back down the elevator and out of the store. My baby was so perfect, how could I put holes in her ears?! I still wanted it done, but did not expect to have such sad feelings about it. The girl who was the “piercing specialist” kept setting things up and sanitizing the gun. It was happening so fast. Wait! I don’t think I’m ready. I need some time to think about this, to remember her without earrings! Austin sat in the chair and held her as they marked the spot where the earrings would go. I could not watch any of this! Thankfully his parents where in town and his mom could be there to make sure they were even. Austin’s dad and I had to walk far away because we couldn’t handle watching, and then I heard it, my baby’s scream that I would recognize anywhere. I could not even hold back the tears and just started bawling right in front of all these strangers who had no idea what was wrong with me. As soon as it was over, I ran and picked her up to hold and comfort her. She was making the saddest little whimper that completely broke my heart in two. As I sat there crying with her, I remembered I hadn’t even looked at her new little earrings yet. As I looked them over, I was filled with instant regret. I hated them at first. It made her look older and so different and I just wanted to pull them out. I felt guilty every time I saw them. Guilty for putting her through that pain, guilty for taking away the option of altering her body for her and guilty that I made her seem so much more grown up. As the night went on and the days turned to weeks, I actually fell in love with her earrings. She got over it in five minutes and actually cried way less than I did. It was much more traumatic for me than it was for her. They look so cute on her and would you believe that no one has called her a boy since? We don’t even have to go out with giant pink bows! I kind of love that we can tell her she got her first pair of earrings on Fifth Avenue in New York. 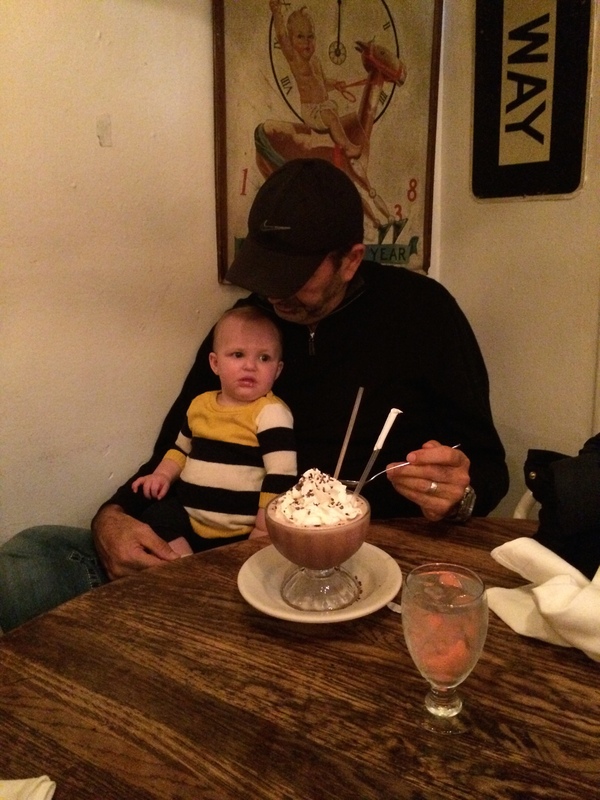 It was a really special night that was celebrated by going to Serendipity 3 for frozen hot chocolate – and Skyler even got her very own whip cream treat from her Papa K.